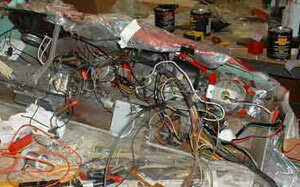 When we took the car apart the wiring harness, or what was left of it, was in no condition to be reused. The old wires were stiff, brittle and had seen their share of cuts, breaks, corrosion and the effects of age. The only exception to this was the behind-the-dash wiring because these wires had been protected from weather and heat. There were a few broken wires in that bundle also, but we decided that most of the dash harness could be reused and connected to fresh wires leading to the rest of the car. 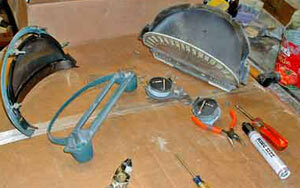 The old harness would be used as a template for a new one. Each of these changes would require re-routing of, or additions to, a new wiring harness, so why not create one from "scratch" and save hundreds of dollars? We've done this many times in the past, so it made perfect sense to do so. We've got rolls of various gauges and colors of wire and a nifty way to color-code them, which we'll show you later. We also fastened a sheet of drawing paper to a stiff piece of cardboard about 2 feet square. On this we would draw a new wiring diagram that fits our car so that we could properly note wire running and color codes. The large size makes it much easier to read later on. More on that later too, but first we tackle the instruments. 1. 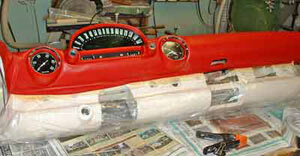 Cleaned, lubricated and repaired the speedometer and replaced the plastic face. Take it apart, fix it and clean it up. It's as far apart as it can get now. 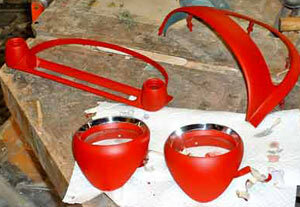 The instrument bezels are painted the new red and ready for assembly. 2. Took apart the old mechanical tachometer and modified an electronic one to take its original needle and replaced the plastic face. 3. Cleaned and repainted the clock and its needles and replaced the plastic face. The clock was not repaired and made to function, since the car will have a battery disconnect switch and we just don't care about having a working clock. Needles are easy to paint, eh? 4. 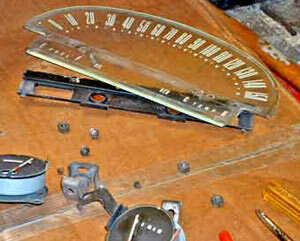 The original, non-working AM radio was cleaned, polished and taken apart. We modified a late-70s GM radio to accept the T-Bird's radio face and made the volume and tuning controls functional on FM only. This was mounted into the dash. 5. Replaced the old 6-volt light switch with a new 12-volt switch left over from our Falcon project. 6. Installed 12-volt light bulbs in all sockets. We installed all components, switches, controls, lights, etc. into the dash. 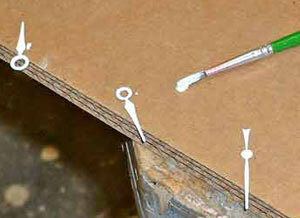 This shows the beginning of installation of components. It's starting to look like a new dash. The old switch — bottom left — is being replaced by the new one — top. Ignition switch is at bottom center. Now able to see the colors of the wires, we commenced the connections. The light switch and ignition switch were wired before installing into the dash because we had to modify the connections to fit the new switch. It was much easier to wire both of them first and then install them into the dash. We followed the original color codes when connecting the instrument wiring, soldering in new sections of wire when necessary. All changes were noted on our master wiring diagram. 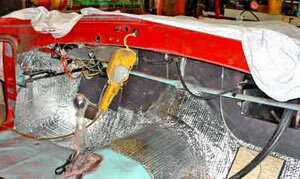 This shows the wiring nearly completed. 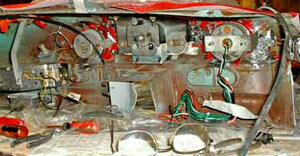 Note that most of the wiring is mounted out of the way of other components to come, like the steering column. New wires to the tachometer are visible at the right and the new speaker is visible above the radio. 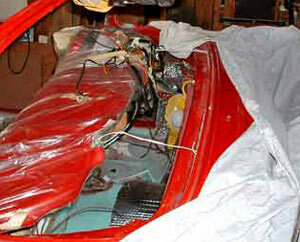 The finished dash was taken out to the car for creating the wiring harness. Before doing so, however, we had already insulated the firewall area of the car and installed the wiper assembly, heater box, air conditioning lines, parking brake and all other equipment we could think of. This was done to minimize having to crawl under the dash later. 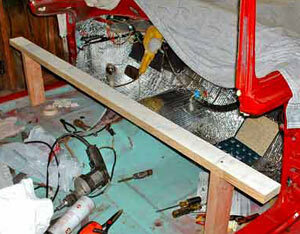 The insulation and dash pad are installed. Note the heater box and A/C lines in place on the right. We didn't want to push the dash into its finished position at this point because we wanted plenty of access behind it while doing our wiring. That meant we'd have to find a way to suspend the dash at the correct height without attaching it. The solution was the construction of a 2x4 stand that was cut to the correct height. We clamped the bottom of the dash to the stand and supported it with some wire to prevent tipping over. This left us with an accessible dash that could be made functional and then slipped into place. The back of the dash is quite accessible. Next, we tackle the main harness. Stay tuned.